In 2009, Swarna Bumi joined the competitive Malaysia express bus industry. The company is a young and emerging bus operator which based in Alor Setar, Kedah. The company plans to increase the number of buses to cater the increasing demands and needs of the customers. Swarna Bumi offers mainly single deck buses with 27 seats and 30 seats. Passengers can enjoy the comfortable ambience with the fully air-conditioned buses. Televisions in their buses entertain both young and adult passengers which ensure them a pleasant journey. The company offers daily trip for bus from Kuala Lumpur, Negeri Senbilan and Kedah such as routes between Kuala Lumpur to Penang, Kuala Lumpur to Kedah, Negeri Sembilan to Kedah and many more. Swarna Bumi bus tickets are sold in several counters at bus terminal of Kajang, bus terminal of Sungai Petani (Ukir Square), bus terminal of Seremban and bus terminal of Alor Setar (Sahab Perdana) to allow customers purchases at their convenience and comfort. The popular bus routes offered by Swarna Bumi are Alor Setar, Sungai Petani and Butterworth to Hentian Duta, TBS (Terminal Bersepadu Selatan), Kajang and Seremban, as well as its return routes. Kick start your journey now with Swarna Bumi! 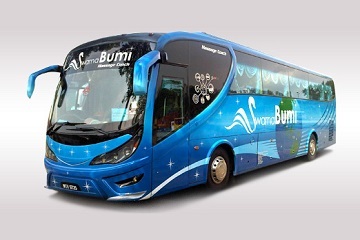 Buy Swarna Bumi bus tickets now at Easybook.com.